I liked so much Fitted Knits book! After I finished the Drop Lace Stitch Tank from this book I cast on for another project from the same book. I hope this project will help me learn the top-down knitting technique too. I am using Barbara G. Walker's technique to firmly join into a ring/round front and back bodystitches after placing the sleeve stitches on scrap yarn to be worked later. 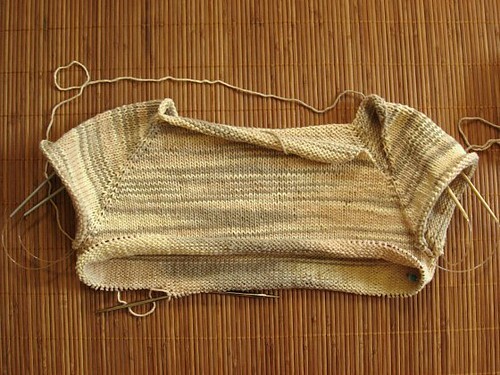 This technique is described in Knitting from the Top book, on page 116, paragraph 3. For this project I decided on a self striping yarn, 50 % cotton and 50 % acrylic, Linate CotoLin Gold from Okiteks, another local Turkish brand. I just love the beige color shades.... I cast on for S size and my gauge/tension is 20 sts/4 " with Stockinette st with US 7 (4.5 mm) Knit Picks circular knitting needle.